The ICANN CA currently generates the keys and certificates necessary to support internal ICANN processes and ICANN's independent role as DNSSEC Root Key Publisher and Manager. 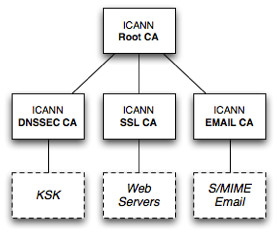 A diagram of the ICANN CA Public Key Infrastructure is shown below. If you have any questions not covered by this note please contact the Key Manager listed below.